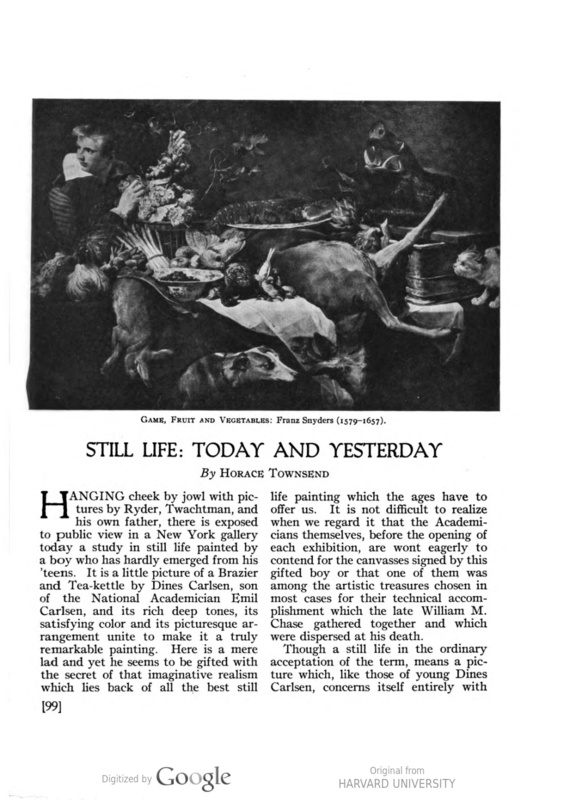 Art and archaeology, the arts throughout the ages, Washington, DC, "Still life: today and yesterday" by Horace Townsend, January - June, 1921, volume 11, page 99-105, illustrated: b&w on page 103. 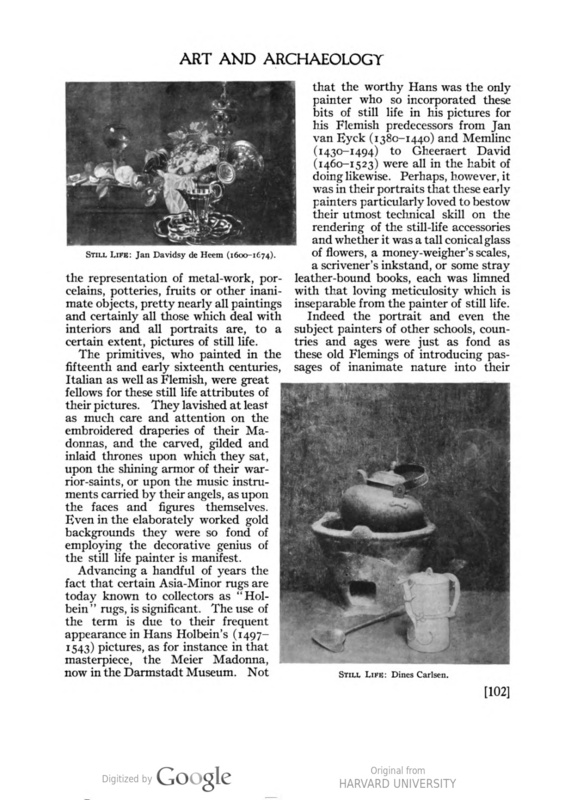 Art and archaeology, the arts throughout the ages, Washington, DC, “Still life: today and yesterday” by Horace Townsend, January – June, 1921, volume 11, page 99-105, illustrated: b&w on page 103.
gifted boy or that one of them was among the artistic treasures chosen in most cases for their technical accomplishment which the late William M. Chase gathered together and which were dispersed at his death. 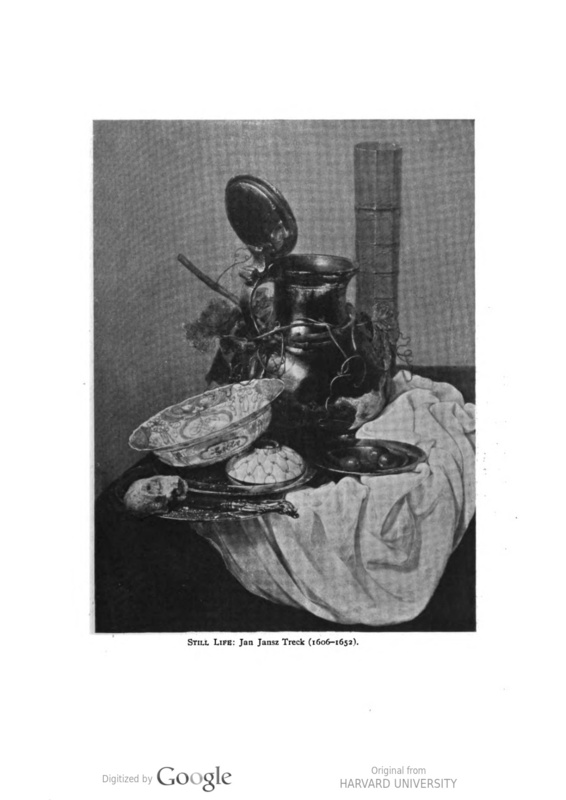 Though a still life in the ordinary acceptation of the term, means a picture which, like those of young Dines Carlsen, concerns itself entirely with the representation of metal-work, porcelains, potteries, fruits or other inanimate objects, pretty nearly all paintings and certainly all those which deal with interiors and all portraits are, to a certain extent, pictures of still life. The primitives, who painted in the fifteenth and early sixteenth centuries, Italian as well as Flemish, were great fellows for these still life attributes of their pictures. They lavished at least as much care and attention on the embroidered draperies of their Madonnas, and the carved, gilded and inlaid thrones upon which they sat, upon the shining armor of their warrior-saints, or upon the music instruments carried by their angels, as upon the faces and figures themselves. Even in the elaborately worked gold backgrounds they were so fond of employing the decorative genius of the still life painter is manifest. Advancing a handful of years the fact that certain Asia-Minor rugs are today known to collectors as “Holbein” rugs, is significant. The use of the term is due to their frequent appearance in Hans Holbein’s (1497-1543) pictures, as for instance in that masterpiece, the Meier Madonna, now in the Darmstadt Museum. Not that the worthy Hans was the only painter who so incorporated these bits of still life in his pictures for his Flemish predecessors from Jan van Eyck (i 380-1 440) and Memlinc (1430-1494) to Gheeraert David ( 1 460-1 523) were all in the habit of doing likewise. 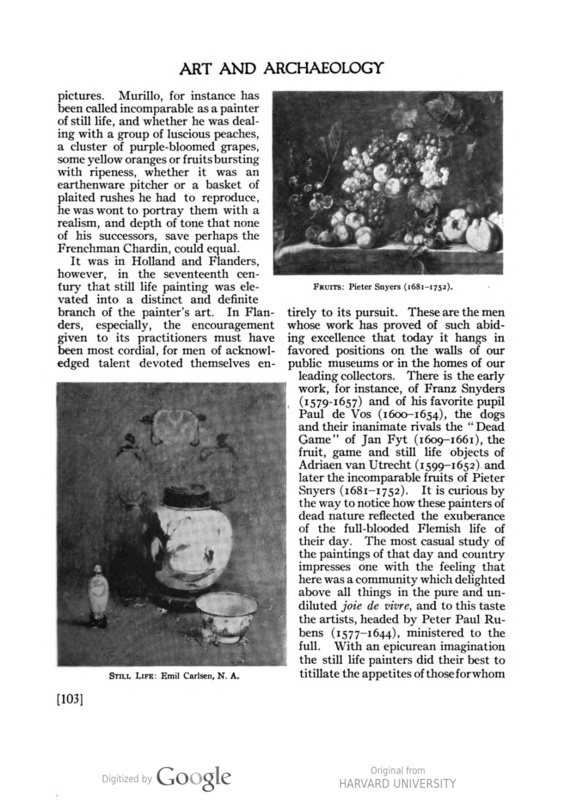 Perhaps, however, it was in their portraits at these early painters particularly loved to bestow their utmost technical skill on the rendering of the still-life accessories and whether it was a tall conical glass of flowers, a money-weigher’s scales, a scrivener’s inkstand, or some stray leather-bound books, each was limned with that loving meticulosity which is inseparable from the painter of still life. plaited rushes he had to reproduce, he was wont to portray them with a realism, and depth of tone that none of his successors, save perhaps the Frenchman Chardin, could equal. It was in Holland and Flanders, however, in the seventeenth century that still life painting was elevated into a distinct and definite branch of the painter’s art. In Flanders, especially, the encouragement given to its practitioners must have been most cordial, for men of acknowledged talent devoted themselves en tirely to its pursuit. These are the men whose work has proved of such abiding excellence that today it hangs in favored positions on the walls of our public museums or in the homes of our leading collectors. 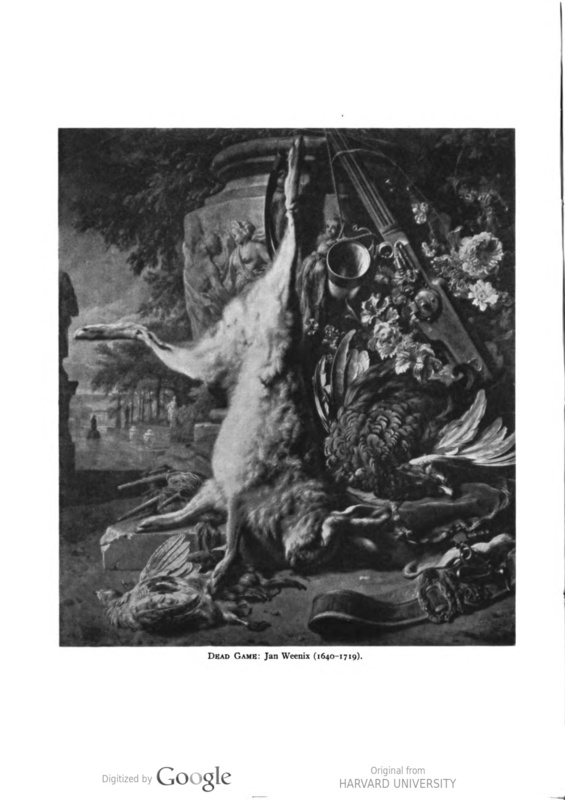 There is the early work, for instance, of Franz Snyders (1579-1657) and of his favorite pupil Paul de Vos (i 600-1 654), the dogs and their inanimate rivals the “Dead Game” of Jan Fyt (1609-1661), the fruit, game and still life objects of Adriaen van Utrecht (1599-1652) and later the incomparable fruits of Pieter Snyers (1681-1752). It is curious by the way to notice how these painters of dead nature reflected the exuberance of the full-blooded Flemish life of their day. The most casual study of the paintings of that day and country impresses one with the feeling that here was a community which delighted above all things in the pure and undiluted joie de vivrc, and to this taste the artists, headed by Peter Paul Rubens (157 7-1 644), ministered to the full. With an epicurean imagination the still life painters did their best to titillate the appetites of those for whom their pictures were painted and in pursuance of this desire they crowded their canvasses with artfully disposed dead game, interspersed with lobsters, oysters and other shell fish and backed with groups of luscious fruits, so that even to this day one’s mouth waters in their contemplation. Not altogether different was the attitude of their rivalling neighbors the Dutchmen. This was the hey-day of Holland’s political and material prosperity and the almost ostentatious luxury of its wealthiest citizens dominated the pictures painted for the decoration of the paneled rooms of their houses. Jan Davidsz de Heem (1600-1674) among others, the noteworthy son of a distinguished father, found his chief pleasure in the deft arrangement and admirable presentation of fruits and flowers, gold and silver vases, musical instruments and richly mounted jewel caskets, while he was especially happy in his rendition of glass ware and crystal which he hardly ever failed to introduce into his pictures. Similar recorders of their generation, to pluck but a few from a crowded quiver-full, were William Klaesz Heda (i 594-1 680), Jans Janszoon Treck (1606-1652), Jan Baptist Weenix (i 621 -1660) and Barend van der Meer (1659- ? ). 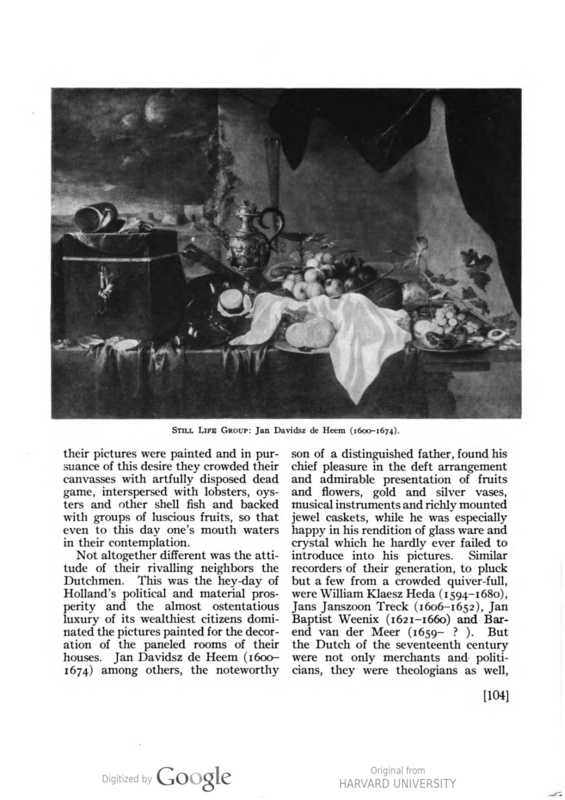 But the Dutch of the seventeenth century were not only merchants and politicians, they were theologians as well and this other side of their characters, its somewhat austere religiosity, is to be seen in another group of still life pictures. Prominent among the painters of these was Pieter Potter (1600-1652), the father of the better known and more capable Paul whose “Bull” is one of the world’s great pictures. 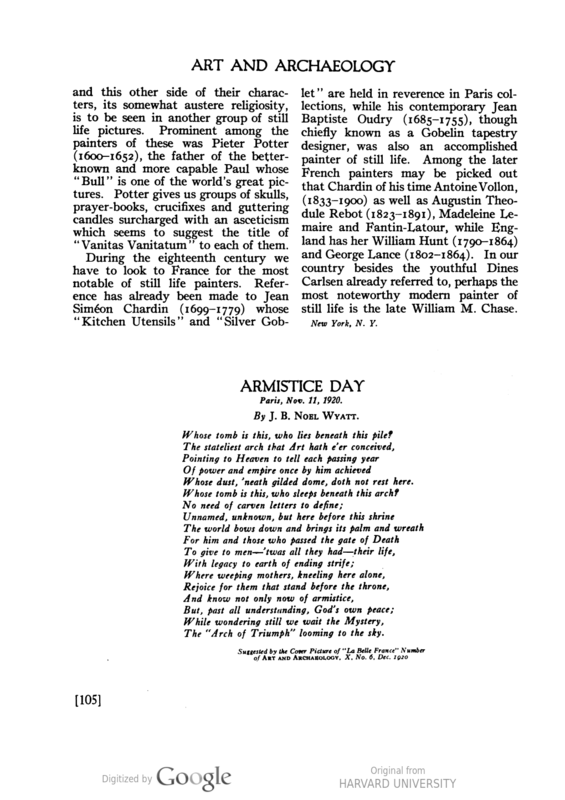 Potter gives us groups of skulls, prayer-books, crucifixes and guttering candles surcharged with an asceticism which seems to suggest the title of “Vanitas Vanitatum” to each of them. During the eighteenth century we have to look to France for the most notable of still life painters. Reference has already been made to Jean Simeon Chardin (1699-1779) whose “Kitchen Utensils” and “Silver Goblet” are held in reverence in Paris collections, while his contemporary Jean Baptiste Oudry (i 685-1 755), though chiefly known as a Gobelin tapestry designer, was also an accomplished painter of still life. Among the later French painters may be picked out that Chardin of his time Antoine Vollon, ( 1 833-1 900) as well as Augustin Theodule Rebot (182 3-1 891), Madeleine Lemaire and Fantin-Latour, while England has her William Hunt (i 790-1 864) and George Lance (i 802-1 864). In our country besides the youthful Dines Carlsen already referred to, perhaps the most noteworthy modem painter of still life is the late William M. Chase. Emil Carlsen : Blue, white and gold, ca.1920.